Ok, So where were we?? Oh Yes, in the last article I told you all how and why we agreed upon having a destination wedding in the hills. Now as we started exploring our options, we were spoilt for choice. Then how we chose the perfect Venue for our wedding? Read on to know !! This one hill station is the closest from Lucknow. It is easily reachable by train or by road in 5 to 6 hours and very familiar to all the guests too. Now I have been to this cute hill station once as a kid and then about a year ago and it is beautiful. The most breathtakingly beautiful views and lush greenery made it an ideal destination. The only problem here was I had no idea of the vendors here. Also, it is a big hill station which is located at a higher altitude and it takes about 2 hours to reach Nainital from Kathgodam. Not many people would be comfortable in coming that long by road driving round and round. Even I was not comfortable with the idea as I get motion sickness quite easily. The day I saw this picture when I searched for wedding venues in Shimla, I just couldn’t stop looking!! I mean just look at the place!! The only reason I thought Shimla could be it was because of this gorgeous venue, the Woodville Palace Hotel, Shimla. I mean to get married in the hills at a palace is the dream right? It was so perfect that nothing came close to it. I had just seen one wedding at this venue featured on wed me good and it was like a dream. This was also the place where the wedding scene of the movie 3 idiots was filmed. We thought of this venue in January and recently the TV couple Abinav and Rubina had there wedding here a few days before our wedding !! So Rishikesh was always close to our hearts owing to its spiritual touch. The boy especially wanted Rishikesh as Wedding is a divine ceremony. Taking pheras with the Ganges and hills around, Rishikesh would serve as the perfect backdrop. Also, it was easily accessible by road via Dehradun. Rishikesh was a strong contender in our list. This wedding that I saw at a resort in Rishikesh on a wedding blog was all kinds of dreamy. Though not exactly a hill station, but it is a beautiful valley with lots of great views and surrounded by the hills. 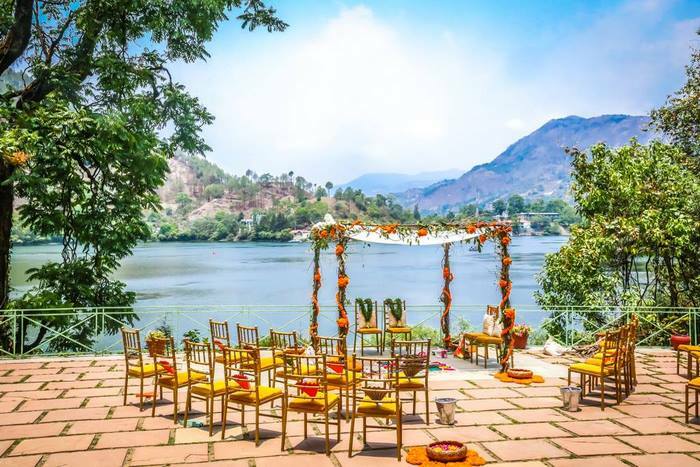 Dehradun has a couple of great resorts that are ideal for a destination wedding. The best part is it is way more affordable than Mussourie or Rishikesh. The only con is the temperatures pretty much remain the same as the plains during the peak summer months. But still, we researched quite a few places here details about which I will mention later. For those who do not know, Mussourie is a cute little hill station at an hour distance to Dehradun. We also came to know this after we considered Mussourie for our destination wedding. It has got really great hotels that exude a vintage charm. On the way to Mussourie from Dehradun, they are quite a few good resorts and hotels that make a good wedding venue. So Finally, we just booked a flight to Dehradun from Mumbai. Yes, that’s how we are!! We just couldn’t decide without actually seeing the venues. So now we had options!! We had Dehradun, Rishikesh and Mussourie and one day to see the venues!! Find out which venues we shortlisted, How we dealt with the vendors and which we actually visited in the next post 🙂 Stay Tuned! !